The Goods Line is a new civic spine for Sydney. Once a conduit for trade, the former rail line is reinterpreted to carry the precious cargo of a thriving neighbourhood - culture, creativity and community. 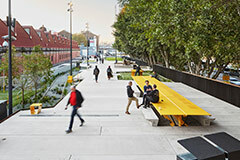 Building on the NSW Government’s vision for a pedestrian and cycle connection from Central to Darling Harbour, ASPECT Studios have led the design for the transformation of this disused Rail Corridor into a vibrant ‘public campus’. Commissioned by the Sydney Harbour Foreshore Authority and in collaboration with design partners CHROFI, ASPECT Studios have created a public destination which connects more than 80,000 tertiary students, locals and visitors to the many major attractions of Sydney’s much-loved Darling Harbour. The former elevated rail corridor features a series of ‘platforms’, which can be used for a variety activities including, public entertainment, recreation, festivals and study. It will further connect arts, education and cultural institutions along Sydney’s Cultural Ribbon. The Goods Line is an example of the potential for design to transform isolated city spaces into creative and connected public destinations which enhance public life. “What was once a conduit for trade has been reinterpreted to carry the precious cargo of a thriving neighbourhood: culture, creativity and community,” says The Goods Line project lead designer and ASPECT Studios director, Sacha Coles. The Goods Line ground plane - constructed of over 600 individual precast concrete planks floats over the original rail line which is expressed along the line. 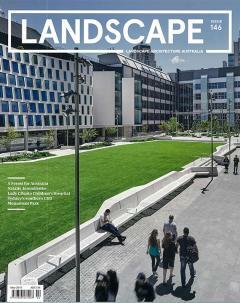 The Goods Line offers sunny turf areas and playable spaces to relax and play off the main pathway. The edges of precast panels behind create a defined edge with kickrail, slightly elevated over a narrow garden bed with gravel. The Goods Line taps into the various cultural, educational, and media institutions such as UTS’s Frank Gehry designed Dr Chau Chak Wing Building. A combination of salvaged sandstone and new brickwork creates the structure for the waterplay channels which interpret the former water channel under the site. The sandstone culvert is an original heritage item from site transformed into a play element; a tunnel for children to crawl through and climb. Two waterplay elements allows children to pump water down the brick channels into the sandpit. The workbench is a communal table and outdoor meeting place. The 12 metre long table with precast concrete seating has power points along its length to encourage working externally. The opening of city streets; Macarthur Street - a new east-west street connection has been unlocked, connecting students and visitors to Darling Harbour’s major harbourside attractions. 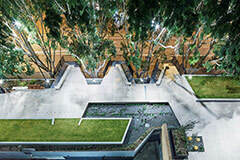 The amphitheatre at Mary Ann Street is designed to be an event space which overlooks the street cul-de-sac and connects The Goods Line back to the thriving city neighbourhood of Ultimo. The heritage listed, Ultimo Bridge stands as the public gateway to The Goods Line and connects the north and south corridors. With the railway line retained and revealed under the mesh walkway, the bridge provides pedestrian and cycle connection from Central Station precinct through to Darling Habour. 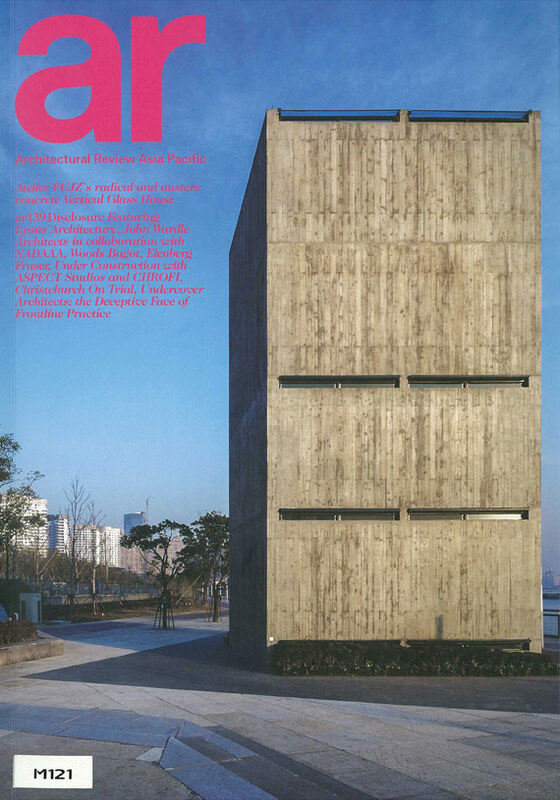 The design utilises the robust materials associated with its rail infrastructure past – gravel, concrete, steel, and timber. Through a design process of digital modelling and a construction process largely undertaken by prefabrication, The Goods Line is a place which speaks to a new kind of social infrastructure where multiple opportunities for gathering, playing, and exchange of ideas can occur. By embracing unique modes of interpretation, the rich history of The Goods Line is revealed and at the same time have created a new identity for the precinct. Loaded with civic ambition and public purpose The Goods Line was painstakingly planned and executed. Each pre-cast concrete panel, light fitting, planting and stool were laboured over and intimately designed down to their finest detail. The Goods Line is the key strategic link and an important green space for this burgeoning part of the city. It provides a connection through to the Devonshire Tunnel under Central Station and Chinatown and Darling Harbour, as well as tapping into the various cultural, educational, and media institutions such as UTS’s Frank Gehry designed Dr Chau Chak Wing Building, the ABC, and Sydney TAFE that border the park. As well as the north/south connection, new east/west street connections have been unlocked. The opening of two city streets; Macarthur and Mary Ann Street has knitted Ultimo back into the thriving city neighbourhood of Darling Harbour and Haymarket. Strategic connections with the surrounding context, highlighting existing and future potential connections made possible through The Goods Line. Existing and proposed major projects around The Goods Line. This diagram illustrates the changing nature of Ultimo. Illustrative concept plan of The Goods Line (North). The strategy behind the design of The Goods Line was to create a strong civic spine and establish a range of opportunities for people to come together, inhabit/ occupy and use the space. Underpinning this first stage is a larger civic ambition of connecting streets and neighbourhoods with the new spine of The Goods Line north. There is a strong overarching narrative in the design of The Goods Line which is to reveal how the site has moved from a place with a rich industrial history to one of social interaction, creative industries, and the promotion of innovation. The move from rail infrastructure to social infrastructure. Study section of the amphitheatre stairs. Early concept sketches, developing the figure of the main path and design elements. The 'Study Pods' cantilever over the adjacent city street positioned between the canopies of existing fig trees offering working and social spaces for students, workers, and visitors. The Mary Ann Steps create an informal amphitheatre and event space overlooking the street cul-de-sac. Off the main path of travel is a series of spaces which invite play and social activity. Two of these spaces provide areas with a ping pong table inviting locals and visitors for recreational activities. The New South Wales Government’s vision for a connected Sydney has come to life. Commissioned by the Sydney Harbour Foreshore Authority and design led by ASPECT Studios in collaboration with CHROFI, The Goods Line is an example of the potential to transform an isolated city space through design, into a creative and connected public destination which enhances the public life of Sydney. 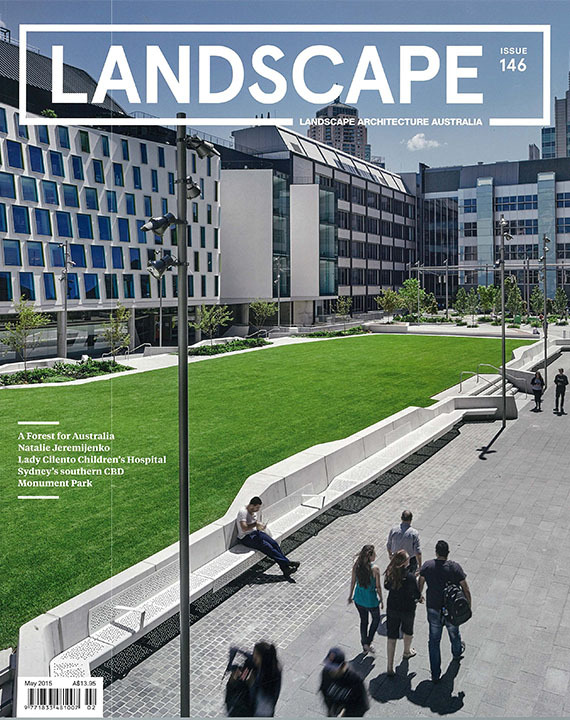 This green urban oasis is a new public campus, a centrepiece and a pedestrian spine for one of the most urbanised and formally isolated parts of Sydney. It is a human centred place offering a range of social experiences from the individual to collective and for all demographics. Loaded with civic ambition and public purpose The Goods Line was painstakingly planned and executed. Each pre-cast concrete sleeper, light fitting, planting and stool were laboured over and intimately designed down to their finest detail. The palette of plants which are set in gravel along the remnant rails are hardy, yet bring colour and texture to the post industrial site. There is a strong overarching narrative in the design of The Goods Line about the move from rail infrastructure to social infrastructure, how the site has moved from a place with a rich industrial history to one of social interaction, creative industries, and the promotion of innovation.